Get the most out of your Mondavi Center experience. *Please note: Prices listed in this brochure will be valid only during the subscription period and cannot be guaranteed after July 15. Dear Subscriber, The launch of a new season is the meeting point of multiple timelines. On one end, there are performances in this brochure that we have anticipated bringing for three years or more: When we learned Michael Tilson Thomas would conclude his tenure with the San Francisco Symphony next season, having him return to Jackson Hall—which he and the SFS opened in 2002—became imperative. On the other end, are those events that came to light as we neared the finish line, such as when we found out, only a few weeks ago, that the iconic singer-songwriter John Prine was eager to make his Mondavi Center debut. In between those longplanned and urgently-added events are others that we booked in the year leading up to our season announcement. For example, through a combination of persistence and luck, we finally snagged the great Metropole Orchestra, the biggest and best jazz ensemble to come out of Europe. 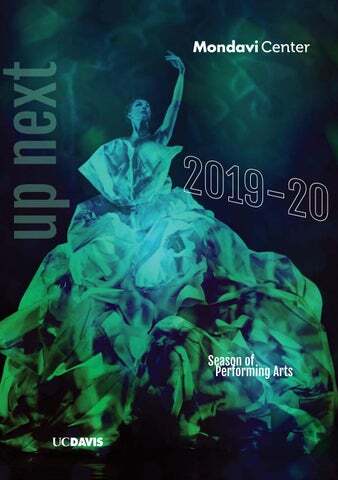 This season, as with every season, we have aimed to strike a balance between much-loved artists in return engagements and those new to our audiences, between emerging artists early in their career and established stars. As always, we think the best way to experience the Mondavi Center is to take the subscription journey, which inevitably brings you riches both expected and brand-new. Whether your tastes run to one genre, or you are an omnivorous arts consumer, we have a subscription package that will fit your budget and give you a broad picture of what’s happening today. As you explore the 19-20 season, I urge you to take a chance on something new. One of the best ways to do so is to explore the DIRECTOR’S CHOICE shows marked throughout the book. These events feature performers who are perhaps not on your radar but truly should be. Year after year, our most enthusiastic audience compliments come from shows like these that have the capacity to surprise. 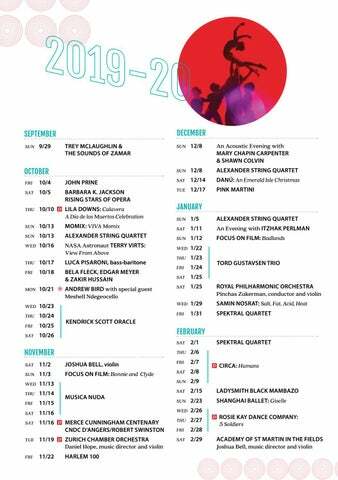 I look forward to welcoming you in the Mondavi Center this season. Orchestra Our signature series showcasing preeminent orchestras from around the world, acclaimed soloists and expansive repertoire, all in the rich acoustic environment of Jackson Hall. We strongly recommend buying the Orchestra Series subscription to guarantee seats. Under the leadership of acclaimed music director and virtuoso violinist Joshua Bell, the Academy of St Martin in the Fields returns for an evening of music-making including the fireworks and lyricism of Paganini’s Violin Concerto No. 1 and only the second Mondavi Center performance ever of Beethoven’s landmark Fifth Symphony. In describing the ensemble’s collaboration with Bell, The Washington Post declared, “Bell was so at one with his fellow musicians, they seemed to be breathing together.” This Leap Day performance is sure to be as special and rare as the date on which it falls. Concert The finest and most celebrated classical artists working today. FRI, MAY 8, 8PM • JH CAB Not part of a series, but may be added on to any subscription package. FREE. Limit 4 per order. This event does not count toward a CYO Subscription. These special events are not part of a series, but may be added on to any subscription package. Enhance your experience and make the most of your subscription benefits by adding on these very special events at a discount. Choreography, music and impeccably trained dancers come together to create unique expressions of the human experience. SUN, FEB 23, 7PM • JH Not part of a series, but may be added on to any subscription package. Take advantage of your season-long subscriber discount to try something new. Jackson Hall Jazz Unparalleled genius and astounding virtuosity presented on our grandest stage. The best seats at the best prices. Studio Jazz Your favorite intimate jazz club, featuring emerging and established artists. American Heritage An ongoing exploration of the diversity and dynamism of the American musical landscape. With A Twist All is not what it seems in this quirky series where you can expect the unexpected! Get up close and personal with some of the most innovative artists working today, in spaces that encourage engagement and discovery. This Visions event is not part of a series, but may be added on to any subscription package. Focus on Film FREE Sunday matinee film screenings curated by Executive Director Don Roth and shown in Jackson Hall. This year’s Focus on Film series presents three films that coordinate with the Campus Community Book Project’s theme of gun violence. See page 31 for the related event featuring speaker Gary Younge. Speakers Provocative and engaging talks from some of the most pioneering and inspirational thinkers of our time. Sometimes, a little distance is all you need to see things in a brand-new way. For astronaut Terry Virts, his newfound perspective was from the International Space Station (ISS), where he installed the Cupola module, granting an unprecedented 360-degree view from the station. When he later became the commander of the ISS, he made good use of the Cupola, taking more photographs than any astronaut who came before him. Many of those images were later used in the National Geographic book View From Above and IMAX film A Beautiful Planet, but to hear Virts tell it, no photo can capture the perfect shade of blue from a sunrise viewed from outer space. As an undergraduate studying English at UC Berkeley, Samin Nosrat took a detour into the kitchen at Chez Panisse restaurant that happily determined the course of her life and career. Since 2000, she has pursued her twin passions of food and words with equal vigor, aiming to create work that inspires, creates community, and raises cultural, social and environmental awareness. Her New York Times bestselling book, Salt, Fat, Acid, Heat: Mastering the Elements of Good Cooking won the 2018 James Beard General Cookbook of the Year, among other notable awards. A documentary series based on the book is now streaming on Netflix. Maggie Haberman, New York Times White House correspondent, CNN political analyst and Pulitzer Prize winner, has established herself as one of the country’s most respected journalists and reliable resources for expert commentary on current events and national issues. One of the most influential voices in national affairs journalism today, she opens audiences’ eyes with a remarkably informed perspective on President Trump, based on their complex relationship and her history of covering him. She examines his influence on key issues affecting all Americans and his battles with the American press. Her stories on covering a contentious administration offer a revealing insider’s look at what is sure to be known as our country’s most explosive era of modern journalism. World Stage A musical journey around the globe with some of the world’s finest cultural ambassadors. Not part of a series, but may be added on to any subscription package. Visual delights that inspire the imagination and ignite wonderment in the young and young at heart. *Youth are ages 17 and under. These Family events are not part of a series, but may be added on to any subscription package. $55	$42	$31	$21 These Family events are not part of a series, but may be added on to any subscription package. Enhance your experience and make the most of your subscription by adding on these very special events at a discount. And remember, youth 17 and under are always 50% off ticket prices! Honor traditions. Learn about other cultures. Forget greeting cards and roses: An outing at the Mondavi Center is the perfect way to celebrate the holidays with the ones you love. Alexander String Quartet The Alexander String Quartet is a major artistic presence in its home base of San Francisco, but is equally beloved in its second home: the Vanderhoef Studio Theatre. The group returns for its 17th consecutive year on the Mondavi Center season. (2PM VST performances only) Robert Greenberg is music historian-in-residence with San Francisco Performances. A graduate of Princeton University, Greenberg holds a Ph.D. in music composition from the University of California, Berkeley, and has seen his compositionsâ&#x20AC;&#x201D;which include more than 45 works for a wide variety of instrumental and vocal ensemblesâ&#x20AC;&#x201D; performed all over the world. The Complete Shostakovich String Quartets Year Two Join the Alexander String Quartet for the second year of its exploration of Shostakovich’s groundbreaking string quartets. ASQ Series 1 Renowned musicologist, author and composer Robert Greenberg provides commentary throughout the concert. ASQ Series 2 The quartet performs this program without intermission, then remains for a Q&A session with the audience. Dmitri Shostakovich The musical career of Dmitri Shostakovich (1906–1975) mirrored exactly the rise and history of the Soviet Union from 1917 to 1975. He entered the Petrograd Conservatory at the very end of the Tsarist era; he witnessed the Revolution and began his career during Lenin’s rule; he was nearly purged twice by Stalin; he flourished under Khrushchev and died while Brezhnev was in power. Shostakovich was a survivor and a great composer, and his fear and self-loathing, his courage and experience found their way into his music. As such, Shostakovich is not just the most important composer of string quartets and symphonies from the 1920s to the 1970s; even more, he and his music stand as witnesses to the rise and failures of the Soviet Union, one of the defining events of the 20th century. CORIN COURTYARD CONCERTS Free concerts for all, featuring local musicians. Held outdoors prior to select ticketed events. CURRICULUM CONNECTIONS UC Davis students have access to $5 tickets when their professor assigns a Mondavi Center event. PRE-PERFORMANCE TALKS (PPT) Context and conversation from UC Davis faculty, guest artists and local experts. These popular halfhour talks are free to all ticket holders. FIRST-YEAR SEMINARS UC Davis faculty members are invited to design seminars focusing on artists performing at the Mondavi Center. Students attend as many as five performances and take a backstage tour. QUESTION & ANSWER SESSIONS (Q&A) A unique opportunity to share reactions and insights following select performances, Q&A sessions feature artists on stage taking questions from the audience. SCHOOL MATINEES These hour-long performances serve as an introduction to the variety of art forms presented at the Mondavi Center. Curriculum based, the School Matinees support K–12 California Common Core State Standards. WORKSHOPS Our technical workshops allow students the chance to see some of the best lighting, sound and stage technicians at work. Go to mondaviarts.org for enhancement details. 1: Jazz at Lincoln Center Orchestra PRE-PERFORMANCE TALK with dancer Lil Buck, choreography assistant Claudia Schreier and Bernard Brown, Assistant Professor of Dance, Department of Theatre & Dance, Sacramento State; 2: Peng & Blair OPEN MIC NIGHT AT MC; 3: SCHOOL MATINEE; 4: Marquis Hill RESIDENCY at Rio Americano High School; 5: MEET & GREET with Wynton Marsalis, MC member Camille Chan and Doug Lee. FIRST-YEAR AGGIE CONNECTIONS Staff and faculty leading first-year “Connections” engage students in discussions surrounding crucial topics related to transitioning to life at UC Davis. They are invited to include Mondavi Center performances in their sessions. CLASSROOM VISITS AND WORKSHOPS UC Davis students learn from our visiting artists in classroom discussions, workshops, postperformance discussions and rehearsals. OPEN MIC NIGHT @ MC A free quarterly opportunity for UC Davis students and community members to showcase their talents in the intimate Vanderhoef Studio Theatre cabaret setting. In the Community RESIDENCIES Many artists appearing at the Mondavi Center offer advanced classroom opportunities for aspiring artists at UC Davis and other schools throughout the region. Photos courtesy of Jim Coulter and Ruth Rosenberg. What your donation means. You have heard it before: Ticket sales only cover a portion of the real cost of presenting performances. Your additional support enables us to provide valuable services to the community. There are tax advantages to your gift. This is all true, but it misses a very important point. Donating helps you become more than just an audience member. When you make a gift to the Mondavi Center, you enhance your experience both in and out of the theater. You are suddenly a member of a large and caring family. You meet people. You notice more things and you feel like you belong in a new and wonderful way. You have increased access to artists, events and information. So we encourage you to keep the arts alive by making sure there is a welcoming home and a promising future for the arts and artists. But we also encourage you to donate for yourself. For a complete list of giving levels and donor benefits, visit mondaviarts.org/give. Please note that price levels are generalized because prices change throughout the season according to demand. Series subscription and Add-On prices are guaranteed through July 14. Renew by May 4 Retain your current series seats or request a different location in advance of single-ticket buyers and receive the lowest ticket prices. APRIL 28 • 9AM-NOON Yocha Dehe Grand Lobby Open House for renewing and prospective subscribers. MAY 4 Last day to renew your subscription to retain your prices and seating priority. JUNE 3 New subscriptions on sale. JUNE 30 Unused event credits from the 18–19 season will convert to donations. Fill out the Renewal Form and have it ready before you call or visit. If you need assistance completing the Renewal Form, contact the ticket office: 866.754.2787. All subscription renewals will be acknowledged with a postcard. JULY 14 Last day to subscribe with guaranteed pricing. JULY 15 Single tickets on sale. Tickets will be mailed in July. With our deferred payment option, you can pay half of your subscription* now and the rest on July 15! *Excludes membership donations. 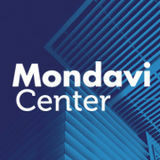 The Mondavi Center at UC Davis has announced their 2019-20 season. Here is a little taste.